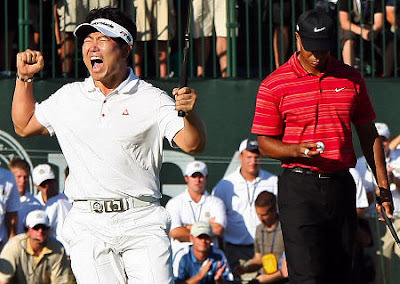 Known for: Despite starting Sunday as a 20-1 underdog ranked #110 in the world, unleashing a shocking performance to ultimately best #1 Tiger Woods (previously 14 for 14 as a closer in majors) for the win in the 2009 PGA Championship. …and we’re totally buying it. Besides possessing one truly astounding great win, Yang really does seem like a pretty great, humble guy–and wouldn’t you know it, also happens to be the very first male from Asia to win a major golf championship. Can you? Didn’t think so. We’re so feeling the hype!